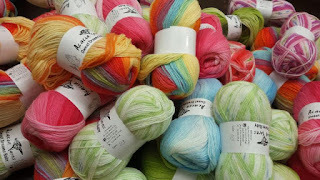 Yarn and Fiber Happenings: New Hot Colors for Summer, A Pure Silk Shawl for Crocheters in Crochet World and Spinners Don't Miss the Horseshoe Caps from Spin-Off! New Hot Colors for Summer, A Pure Silk Shawl for Crocheters in Crochet World and Spinners Don't Miss the Horseshoe Caps from Spin-Off! What new and what's hot! New KWF t-shirts in dazzling colors in tie-dyes and solids! New Knitting with Friends, Spinning with Friends and Hooking with Friends tie-dyes including exploding colors in Pinky-Purple, Summer Meadow, Spring Day and Petunias! All shirts have lovable fiber animals imprinted onto them expressing a witty twist on their day! Deep Purple has also arrived in the solid shirts in Hooking with Friends, Knit 2 Together, 3 Friends and Witches design! Another fabulous color! Like to crochet? Us to! Did you see that the August 2010 issue of Crochet World has a beautiful shawl crocheted by designer Nancy Nehring in the Ivy Brambles Pure Silk in Coppermine! Stunning! We know lots of you are always looking for a great source for crochet garments, and Crochet World has many! Not a subscriber yet? Go to their website and become a Digitized Subscriber and the current issue as well as access to the past two years of issues are yours! And then come back and get the perfect colorway for you in the Ivy Brambles Pure Silk! You will be on your way to a fabulous shawl before you know it! Spinners! In the Summer 2010 Interweave Spin-Off Handspun Gallery featuring Horseshoe Caps is a beautiful handspun cap which was sent in by designer Gina House using Ivy Brambles 4 oz Merino Roving in colorway Fireball! Check out the Interweave Spin-Off magazine/website for info on the cap and we have the Fireball roving colorway in Merino Wool if you decide it is for you! Enjoy!